We had several living in the woods near us in Omaha. My husband had his orchids in an unattached garage and they’d startle him sometimes when he’d walk back to the house after dark. It was cool though having them nearby. You got some good pictures! It’s good to hear from you Nancy. I’ll have to stop over and see what you’ve been up to. I do like the owls, although I can imagine if one flew at me it would probably freak me out. They are magnificent birds. Good shots! An anniversary like that is going to have this kind of effect on you. Thanks William. I’m beginning to feel better about everything. Time does wonders. Excellent photography! I don’t know when I’ve seen a photo of a pair of owls. Lots of Chinese symbolism is based on the sound of the word IN CHINESE. For example, when an owl says “hu,” it sounds as though it’s saying “digging” in Chinese. But since it doesn’t sound like “digging” in English, I don’t think the symbolism applies to us English speakers. I’d say, seeing those beautiful owls is good luck. I hear them, but never see them. I see the hawks, eagles, woodpeckers and lots of critters, but the owls are very well camouflaged. Amazing that you not only saw them, but caught them with the camera! I’ve been able to find them because of hearing them first. They tend to hang around the same places so I know where to look. 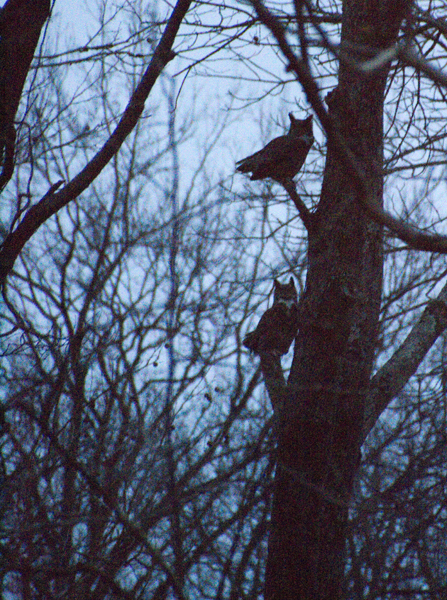 They also appear as a large lump on the limb in the woods. I spot them that way sometimes. What a great photo-op. I had not idea that owls could turn their heads 360 degrees or had fixed eyes. All very fascinating. Hope you are managing to stay warm. Hugs to you too Kathy. I’ve heard owls in the summer at night, but I’ve never ever seen an owl live in the wild. It would be so nice to do that..maybe someday. I see the owl sighting as possibly a sign from your folks that they’re all right. But that’s just me. Either way I’m glad you got to see him! Living here was the first I’d ever seen an owl in the wild. It still amazes me everytime I do. When I saw them recently, I thought the same thing, that they were a sign. Thank you. I love owls. Many years ago my son and I were driving through the cemetery on the way to school. We loved this route because we often spotted coyotes. It was a great way to start the day. 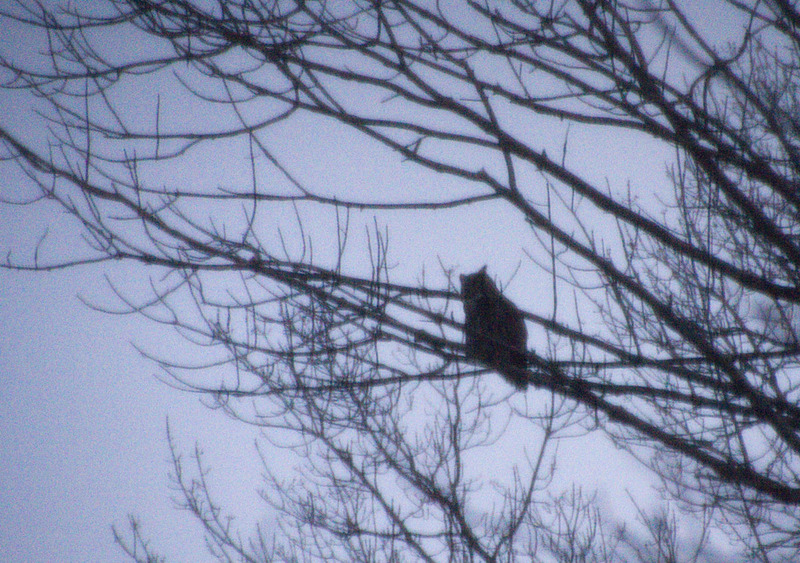 This morning, out the fog, an owl caring a squirrel flew directly in front of the car. Cole must have been about 8 and I was worried he would be sad about the squirrel—not at all he was delighted and oh so excited! He quipped that the owl had breakfast to go just like we had that morning. In an attempt to draw some empathy for the squirrel I said, Poor squirrel, to which he remarked that owls had to eat too. True, I guess. Gruesome little boys. Your owl is amazing and very handsome—absolutely no doubt that it was a sign from your parents, how could it not be! I’m glad your son took that owl and squirrel experience so practically. I’m afraid I wouldn’t have been so cavalier, even though I love the owls, realize they have to eat too, and am a meat-eater myself. I just hope I never have to witness it. We have seen the aftermath of an owl’s or hawk’s successful hunting as a patch of downy feathers in our garden. Your father’s guardian has visited you, no doubt in my mind about that. I’m glad you are slowly feeling better, Christine. About 25 years ago- 6th grade- my older brother and I had heard an owl at night. We decided the next day to go for a hike where we thought we had heard it coming from- it was across a couple of corn fields and into the woods over a mile from our house. We talked about how cool it would be to find the owl but never expected we would during the middle of the day. We walked into the woods a bit until we happened upon a clearing. In the middle of the clearing was a giant old tree stump all gnarled and miss ridden. The sun was shining a bright beam through the canopy right onto the stump. On top the stump was the biggest great horned owl I have ever seen. We froze in awe as it looked at us and paused before it flew away. I always thought it was a great experience and it always stuck with me. However I am SO glad I had never heard of these Indian death prophecies at the time!!! 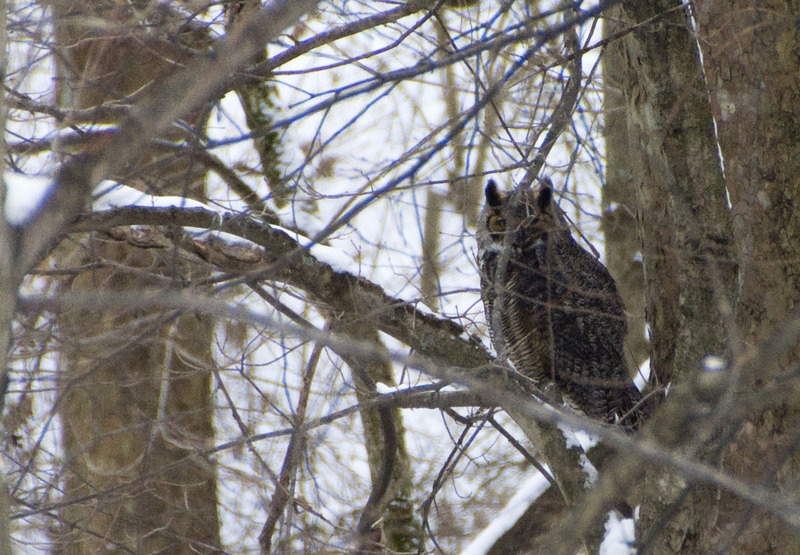 It was one of the few times in my life I have seen an owl in the wild (although we hear a lot) let alone mid-day! Previous Previous post: How long is long enough to grieve?